Patti Leeke made these cute little purse cards for our llama swap. 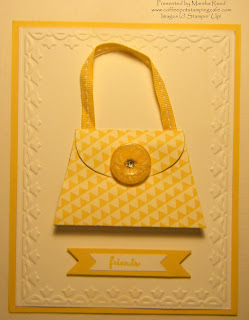 I love this Petite Purse Die! A wonderful friend of mine (Jean Fitch, you know who you are!) gifted me one for my birthday. I was so thrilled to get it and have made lots of these little cuties. My grandsons even made them for their teachers for Teacher Appreciation Month. They are a big hit wherever I take them.